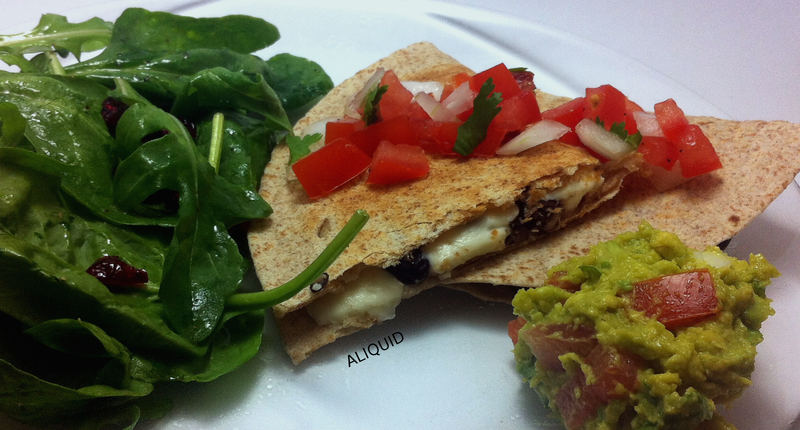 Today I indulged my craving for Mexican food once again by making black bean quesadillas with homemade pico de gallo and guacamole. I decided to try using an actual Mexican cheese rather than the Kraft "Mexican blend" stuff that comes shredded in bags. I ended up buying queso panela, which I've never had before, but the description sounded promising. It turned out to be very mild, like a salty mozzarella (very similar texture too). It didn't actually melt fully, but got very soft. If you like pea soup (or, heck, mushy canned peas) you'll probably like this. It had a subtle flavor from the onion and herbs, but if you wanted to make it bolder you could add pretty much any seasoning you like. And finally, here's a little linguistic tidbit for you: the word pea comes from the Latin pisum. It was originally borrowed into English as pease, hence the term "pease porridge". Eventually people thought pease must be a plural, so they created the new singular form pea. Wow! Before we get started, I wanted to tell my loyal readers that since I'm getting married in one month from today(!!!!! ), I'm going to be giving my nails a bit of a break. I'll still paint them from time to time (for the next Polish Days for example), but I'll be trying to leave them bare more often than not. That doesn't mean I won't be posting! I'd especially love to answer some language questions from you all, so send 'em in! You should also follow me on Facebook and/or Twitter, as I post lots of things there that aren't quite blog-worthy. Moving along! I don't know why I keep insisting on swatching holographics when I know my camera can't really handle it...but they're so pretty! 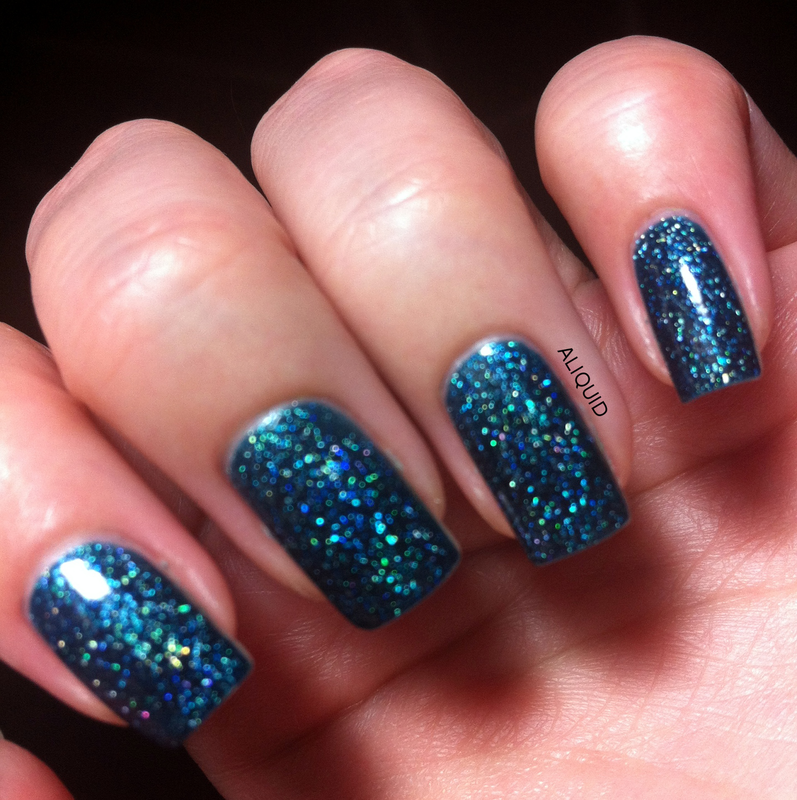 Today I have Orly Sparkling Garbage from their new Mash Up collection. It's a pale teal jelly with a metric crapload of tiny holographic glitter in it. This stuff nearly seared my retinas in the sun! First off, here's a shot in the shade, where the glitter looks silver. You can see how tightly packed it is! Orly Sparkling Garbage. Three coats with one coat Out the Door topcoat. And here's the obligatory out-of-focus rainbow shot. 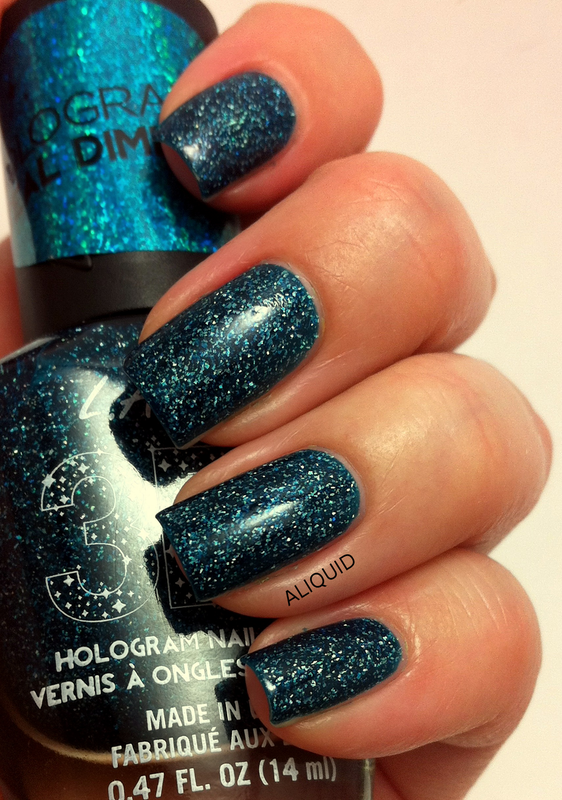 Even though this is a scattered holo, there is just so much glitter that at times it almost looks like a linear holo! Finally, this lightbox shot shows off the color of the base a bit better. The formula on this was very nice, better than other Orlys I've tried actually. I didn't get any bubbles or pulling. Even though Sparkling Garbage is a jelly, the glitter does a pretty good job at hiding my nail line. 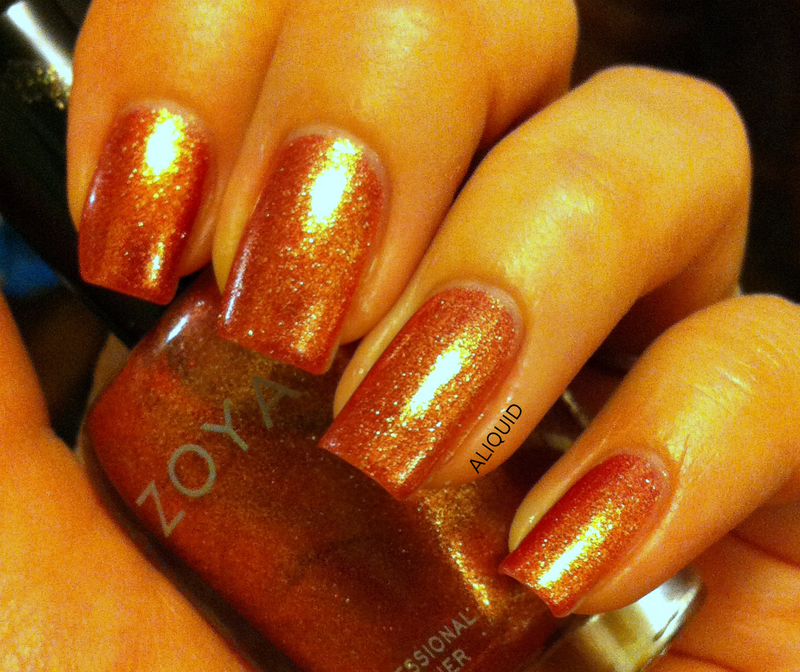 I wish I could show you the full glory of this polish, but trust me, if you like holos you'll love this! I bought Sparkling Garbage at Sally Beauty Supply ($7.19 for 18 ml, only $6.49 if you're a member of the Beauty Club). Orly polishes are 3-free. This week I decided to make two vegetable dishes from A Feast of Ice and Fire: The Official Game of Thrones Companion Cookbook. I've made a couple recipes from this cookbook already and they turned out great. 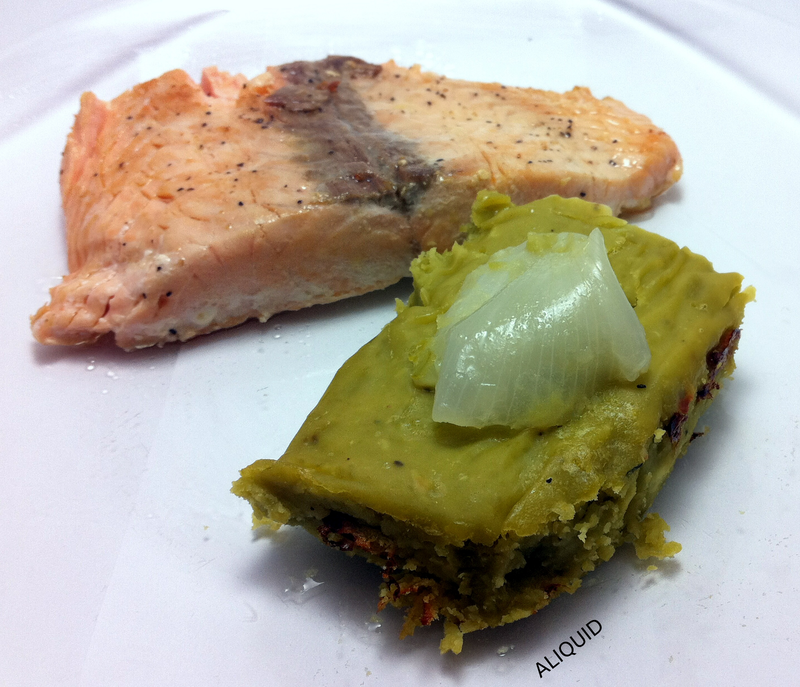 I like how for each dish, the authors give both a modern take and one inspired by a medieval or Roman recipe. It's interesting to see how people in the past cooked differently, especially with respect to seasoning. 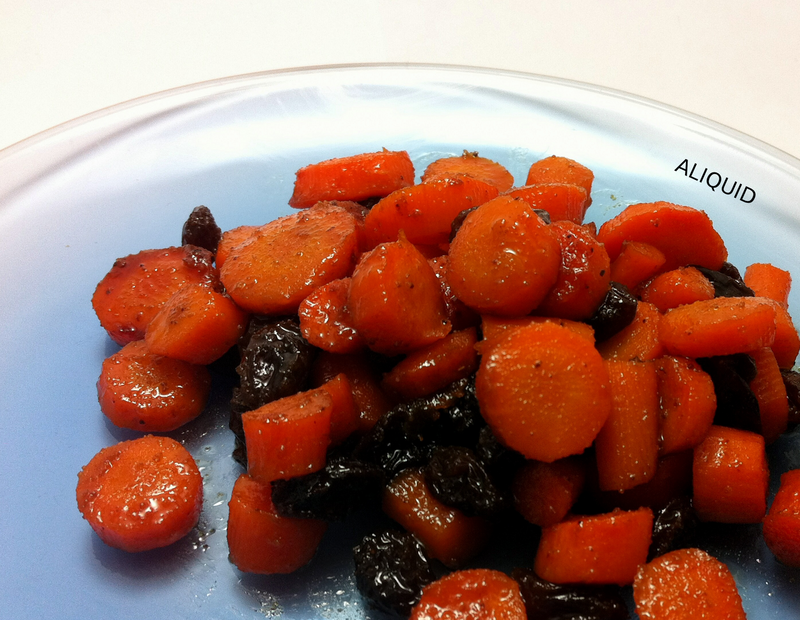 Anyway, my first recipe was Roman buttered carrots (from the King's Landing section, if you're interested). For this recipe, you boil the carrots very briefly, then add raisins, honey, white wine vinegar, melted butter, cumin, and pepper. You roast them in the oven at 400 for about 20 minutes, then add a little white wine to deglaze the dish, and you're done! You can tell by the ingredients that this dish is primarily sweet, but the cumin and pepper prevent it from being too one-note. I think I would use a bit fewer raisins next time, but other than that I liked it! Looking at the original recipe (from the 4th century cookbook by Apicius, a big source of our knowledge of Roman cooking), it called for parsley, dried mint and lovage (a kind of herb), olive oil instead of butter (of course), and fish sauce, which the Romans put on basically everything. (You can still buy it!) As far as I can tell, it's pretty similar to Asian fish sauce, so I might try adding that next time for a more salty and savory twist on the recipe. Hey all! I'm adding a new feature to the blog called "Ask a Linguist"! Language is a big part of what makes us human. So, of course, people like to think and talk about talking--especially linguists! But most people haven't had the advantage of studying linguistics in school and aren't familiar with what linguists do. 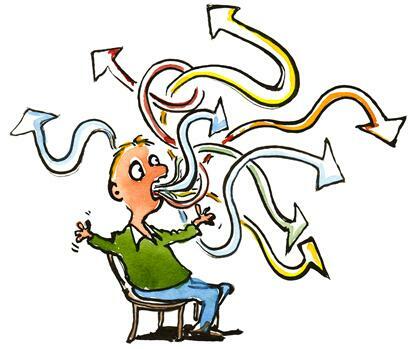 So I'm issuing an open invitation to anyone who is curious about language: send me your questions, thoughts and musings, and I'll do my best to respond with as little jargon as possible! If I'm not sure how to answer, I'll try to point you in the right direction. Also, if you overhear someone talking in an interesting way, or making an interesting slip of the tongue, tell me about it! To send me a question: email me, tweet me, Facebook me, comment on a post, send me a smoke signal...whatever works! Remember, there's no such thing as a dumb question! Lovely! With two coats my nail line was just barely visible, so two will be fine if you have shorter nails. The polish dries to a pretty smooth texture despite all the glass fleck. The one downside to Purple Twilight was the formula. It was a bit gloopy and seemed to cling to the brush; I'm not sure if it was due to the polish base or the large amount of flecks. In any case I did end up with a bit of streaking that you might be able to see on my ring finger. A drop of polish thinner might help. Despite the formula I do recommend this polish if you love purple, glass fleck finishes, or both! Purple Twilight is available at Tough as Nails' Etsy site ($9 for 15 ml or $5.75 for 7 ml). 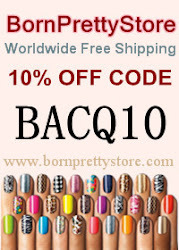 Tough as Nails lacquers are 3-free! Last month I posted about the linguistic process of analogy--where speakers change one part of their language to be more like another part. In that post, I mentioned that in general, a given irregular pattern in a language will tend to become regular over time. This raises an obvious question: if speakers tend to eliminate irregularity, then why aren't all languages totally regular by now? Where do new irregular patterns come from? The answer is actually quite simple: they're accidental. My first ever post was a review of an Indigo Bananas polish, and now I have another! Indigo Bananas is an indie brand that first started gaining renown with an amazing collection of multichromes, and has now expanded to holographics. Her Executive Holos collection is inspired by Eddie Izzard; what I like about the collection is that each polish is not just a holo, but has something else going on too. Executive Transvestite (great name!) 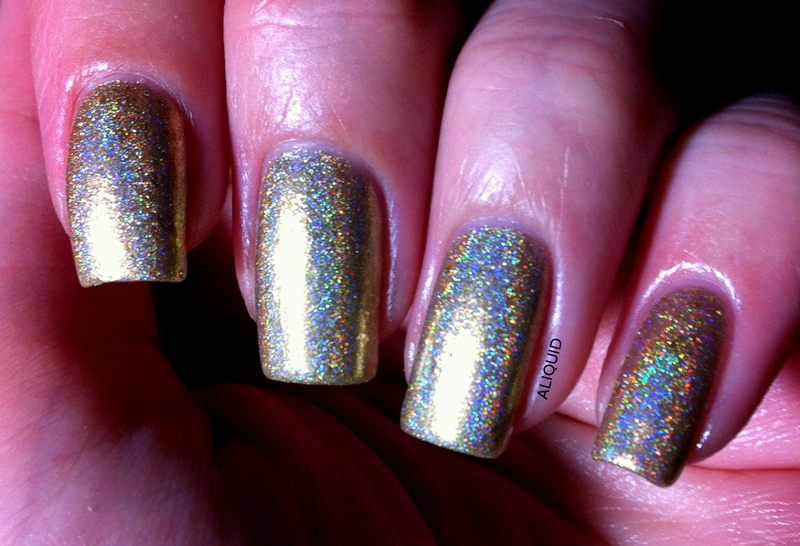 is described as "a gold linear holo foil (metallic and holo at the same time) with a scattering of small gold flakies throughout". I tried to capture both the holo and foil aspects of the polish in my photos. The pics aren't as great as I would have liked, as my camera is apparently confused by linear holos, but I think you'll get the idea! Indigo Bananas Executive Transvestite, 3 coats with 1 coat Out the Door quick-dry topcoat. Shade. But then you go into the sun and it's WHAM RAINBOWS! Indigo Bananas Executive Transvestite, 3 coats with 1 coat Out the Door quick-dry topcoat. Direct sun. Notice that you can still see some gold flakes in these shots too. Indoors the holo is generally weaker, and depends on the light source. Here are a couple pics. 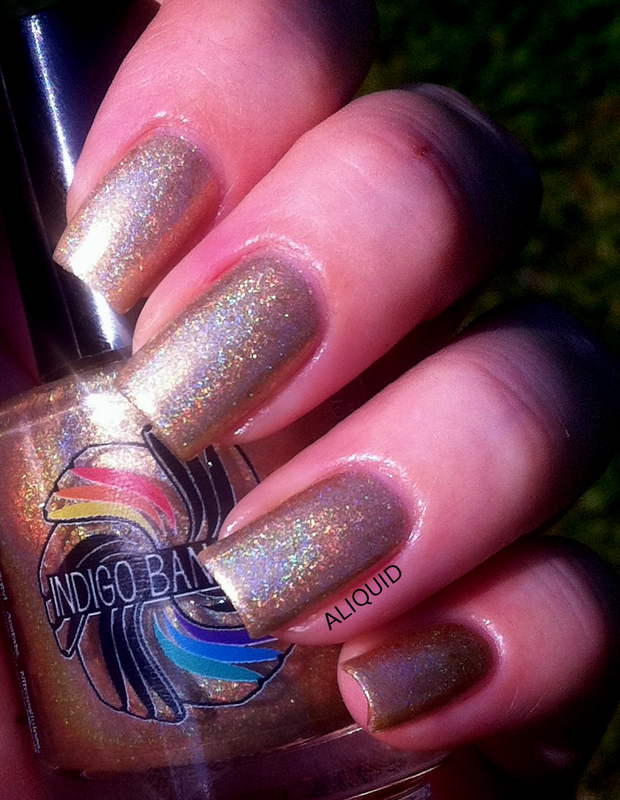 Indigo Bananas Executive Transvestite, 3 coats with 1 coat Out the Door quick-dry topcoat. Indoors with daylight lamp. Indigo Bananas Executive Transvestite, 3 coats with 1 coat Out the Door quick-dry topcoat. Indoors in lightbox. The formula on this polish was really great and easy to apply. Occasionally one of those gold flakes got stuck on my nail tip, but no biggie. The polish did take a while to dry, even with a quick-dry topcoat, probably because I needed three coats of it. Here's one more bonus pic I snapped while lying in bed! Look at that rainbow! Executive Transvestite is available on Indigo Bananas' Etsy page ($12 for 15 ml or $5.50 for 5 ml). 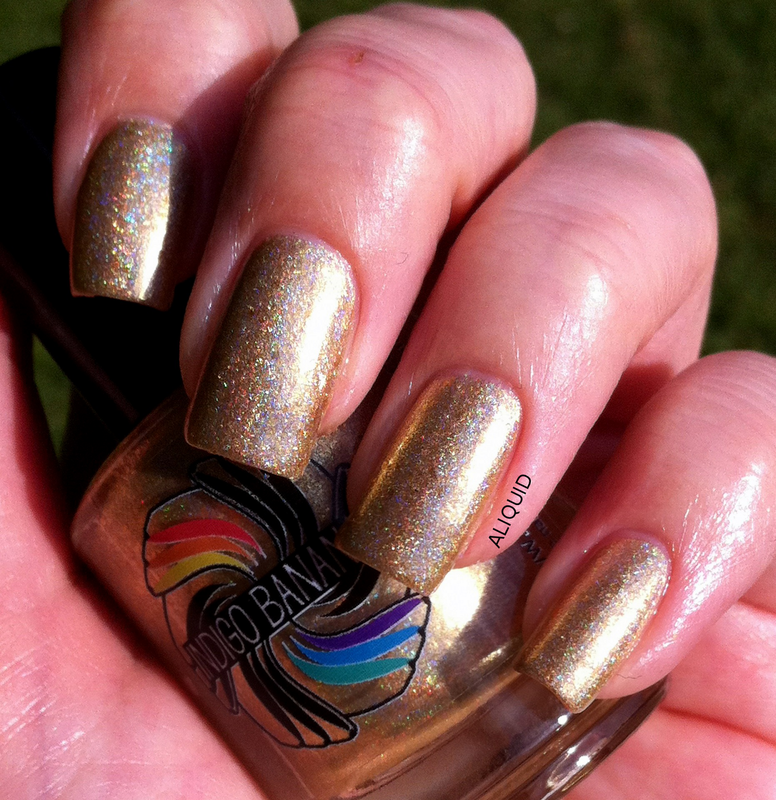 She's currently transitioning to a new bottle shape, so the polish might be temporarily out of stock. Indigo Bananas is 3-free, vegan and cruelty-free! I made another great side dish last night for my fiance! I grabbed this recipe from Ina Garten's The Barefoot Contessa Cookbook. If you like curry, you will like this, and it's much easier than making an actual curry. My favorite part of this dish is the dried cranberries--they add a real pop of sweet/sour to the curry flavor. All you need to do (other than making some couscous) is whip up a dressing of equal parts yogurt and olive oil, a little bit of white wine vinegar, some curry powder, turmeric, salt and pepper. Then add some scallions, grated carrot, parsley, and dried cranberries. The original recipe also calls for red onion and almonds, but my fiance doesn't like raw onion and I don't like nuts, so I omitted those. Ina also notes that you can use lots of other types of dried fruit, like currants or golden raisins. You can vary the spiciness of the dish according to what blend of curry powder you use; I'm a big baby when it comes to spicy, so mine just had a little bit of heat. 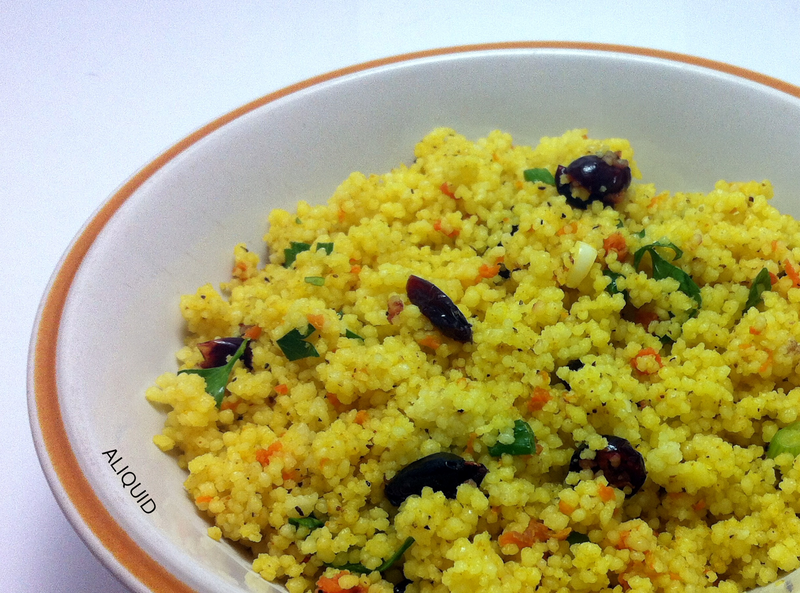 Another great thing about this recipe is you could replace couscous with your grain of choice. 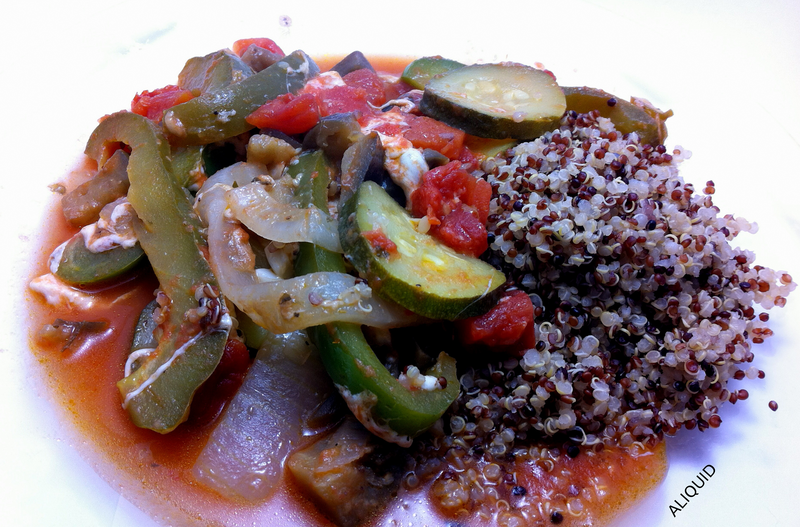 I'm a big quinoa fan, so I might try that next time! Heh, two days after I talked about eating healthy I'm posting this. Yesterday I made a batch of Martha Stewart's "perfect macaroni and cheese" for my department's grad student picnic. 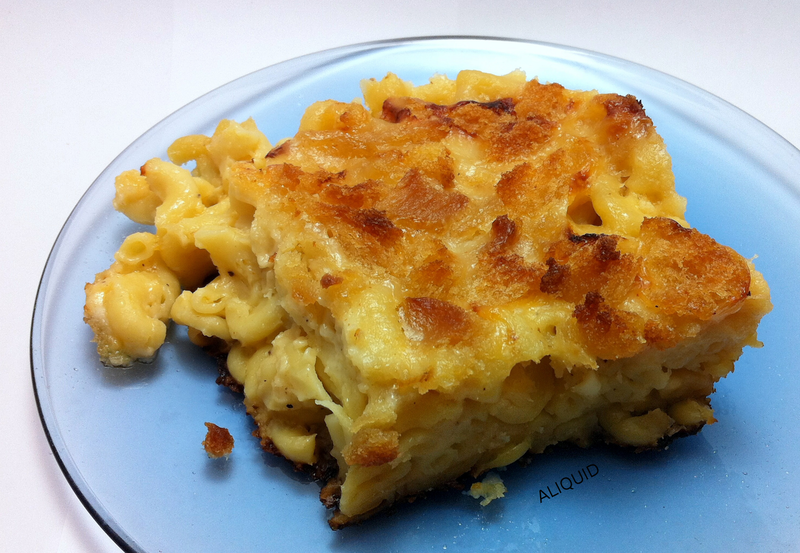 Luckily I ended up with some leftovers, because this is seriously the greatest mac and cheese ever. I've made it around ten times and it always vanishes within two days. You can find the recipe at this New York Times blog post. You'll notice first of all that this recipe contains over a pound and a half of cheese and a whole stick of butter, but who's counting? But this stuff is not just a cheese bomb: it also has nutmeg and cayenne pepper, which give it a bit of a bite and a more complex flavor. Not to mention that crunchy top of homemade bread crumbs! It's pretty easy to make, just time consuming. To make the cheese sauce, you first have to make a white sauce by whisking butter, flour and milk for what seems like a million years. Not to mention shredding all that cheese (because you wouldn't buy pre-shredded cheese for this masterpiece, would you??). I'm lucky my fiance is coming to visit so he can finish the rest of this stuff, otherwise I might overdo it! Hey folks! 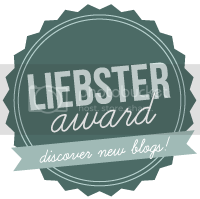 Before I get to the food, you may have noticed that my blog looks a little different! I wrestled with Blogger for a few hours today and ended up with a new banner and buttons. I made those images with PicMonkey. I also got some new social media buttons--this site has a bunch of sets to choose from. Finally, I set up a Facebook page to complement the blog. Give me a like if you want! OK, on to the good stuff. I have to get back on the wagon after last week, food-wise (mostly thanks to a lot of leftover bridal shower cake!). In my opinion, the easiest way to eat healthy is to cook up a bunch of vegetables with good, hearty flavors--it's more enjoyable than a piece of steamed broccoli, and it can really make you feel satisfied. So I whipped up a Dutch oven full of ratatouille! I basically followed this recipe, except I omitted the mushrooms (yes, I'm a cretin), used canned tomatoes instead of fresh, added some white wine, and threw some mozzarella on top. Ohhh yeah. The veggies are nice and soft, and the mozzarella and Parmesan give them just a bit of savoriness. I made some quinoa to add some protein and soak up the juice. This is a very simple recipe, and you could spice it up any way you like--by adding different herbs, for example, or maybe some lemon juice. I've got a month and a half before my wedding, so let's hope I can keep eating healthy! I have some super fun nails right now! In my ongoing effort to perfect my dotting technique, I followed this tutorial and really love the result! I started with two coats of Revlon Sunshine Sparkle, and then added two coats of Essie Lapiz of Luxury on half the nail. 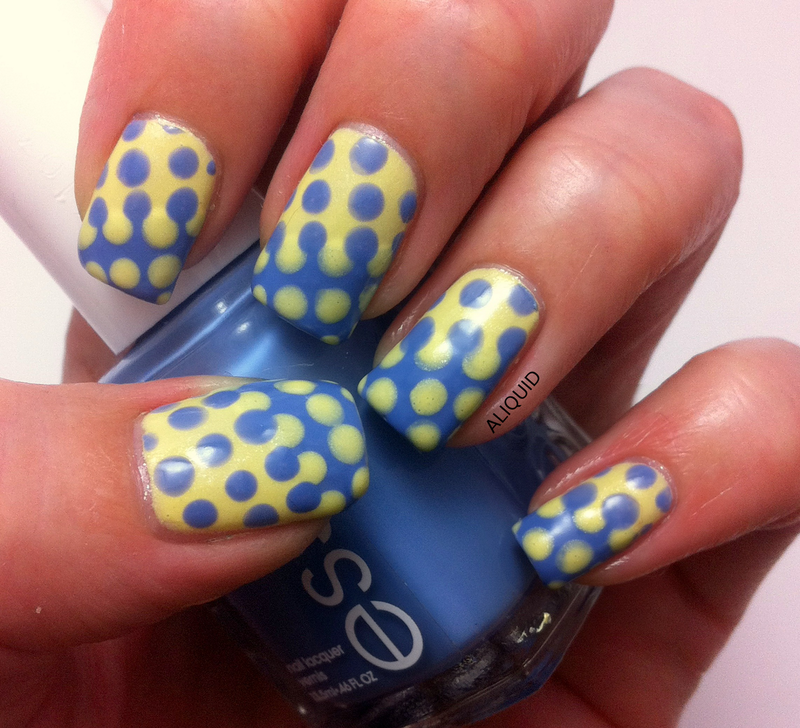 (If you try this mani, don't worry about getting that diagonal line perfectly straight, as it will be covered by dots.) I used a large dotting tool to add the dots. Both polishes were a little more watery than I would have liked, especially the Revlon, which led to some fuzzy dots, but on the whole I really like how this turned out! I sealed this mani with Out the Door quick-dry topcoat. I've used quick-dry topcoat in the past (specifically Seche Vite), but it made my polish peel off in sheets after a day or two. I'm hoping Out the Door doesn't have the same effect! By the way, my camera once again got confused about colors--the Essie is a blue-leaning purple to my eye. What's your favorite kind of dotticure? I LOVE Mexican food. I could probably eat it every day. My favorite is anything covered in cheese. Unfortunately for me, if I ate cheesy Mexican food every day, I'd weigh...a lot more than I do now. 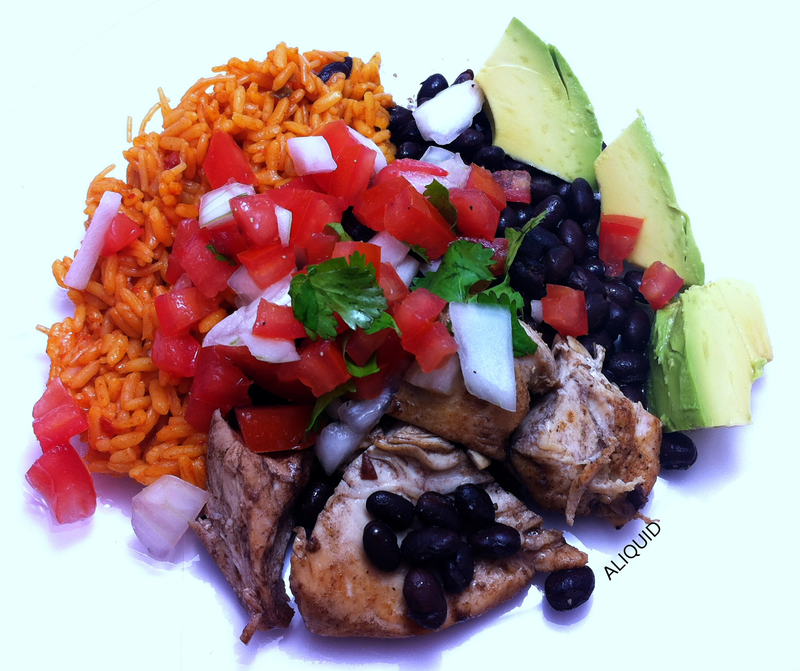 So this week I decided to make a somewhat healthier dish that still satisfies my craving for Mexican. This was vaguely inspired by the adobo chicken bowl I had at Cosi last weekend. First, I left some chicken breast to marinate in grapeseed oil, cumin, chili powder, garlic powder, salt and pepper. Meanwhile, I cooked some Spanish rice (I confess, it was a boxed mix!) and made some fresh pico de gallo (tomato, onion, cilantro, lime juice, salt and pepper). Then I cooked the chicken in a pan with some oil. When it was almost done, I added a can of black beans to get them heated up. I threw a bit of everything on a plate, added some avocado chunks and sprinkled some lime juice, and voila! Super tasty and pretty good for you! Next time I think I'll add some corn too! Are you a cilantro lover or hater? The weather's been pretty summery lately here in upstate NY. 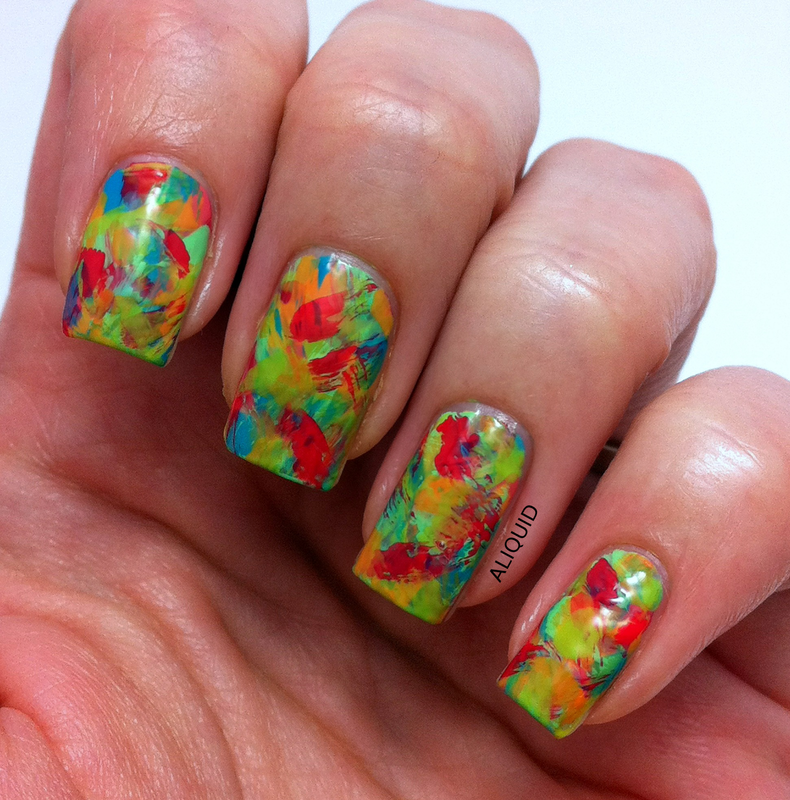 I thought I would encourage it with this mani! I love the brushstroke method because it's foolproof, even for the artistically impaired such as myself. (Here's a tutorial.) I didn't bother to do a base color for this; I just used 8 colors, cycling through them twice, and was able to get enough coverage. 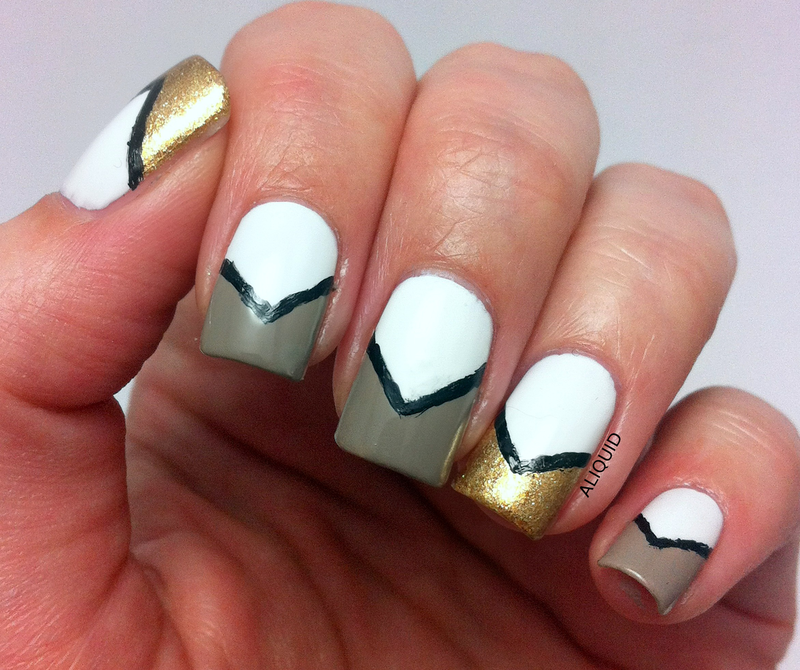 Have you ever tried a brushstroke mani? What color scheme did you use? 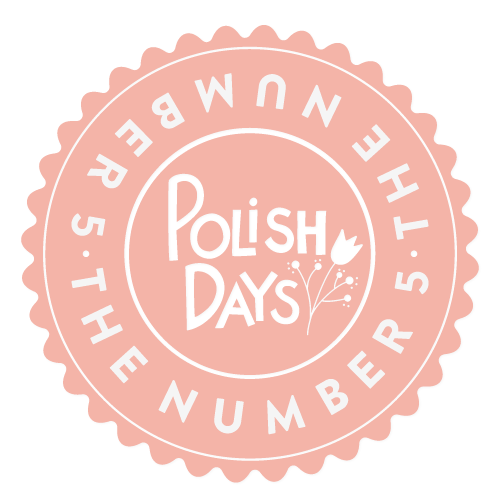 I'm excited--this is my first time participating in the Polish Days blogger event! The theme for this month is "the number 5". This is a pretty broad prompt, so I thought for a while about what I should do. Then it hit me: the five wizards! If you're at all familiar with The Lord of the Rings, you know about the wizards Gandalf and Saruman. But did you know there were actually five wizards? They were angelic beings incarnated in mortal bodies, sent to help the people of Middle-Earth fight Sauron. 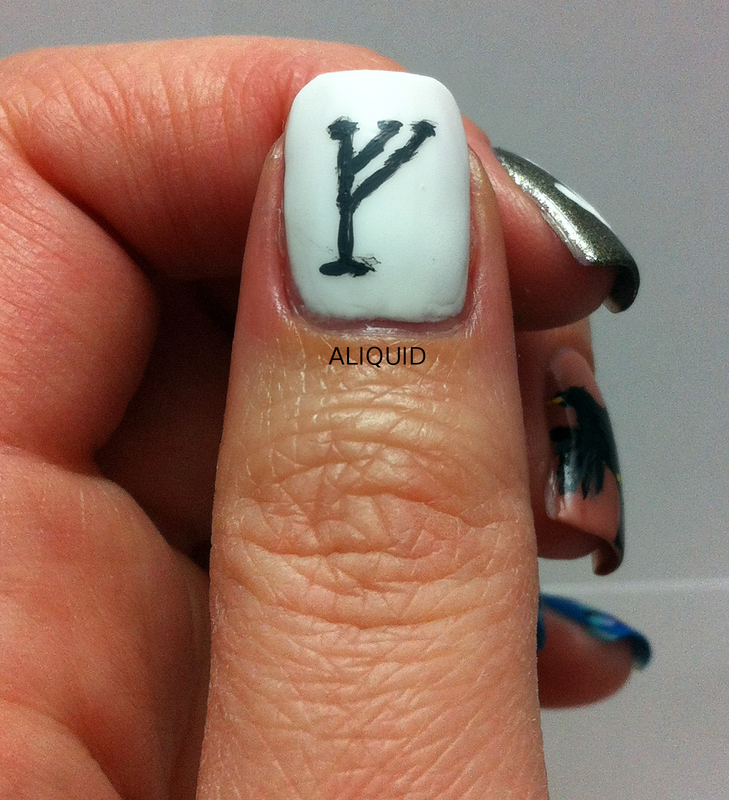 Saruman is on my index finger. I used Revlon Carbonite as the base because it reminds me of the war machines he built at Isengard. Then I painted the White Hand (the symbol his orc soldiers wear) with acrylic paint. 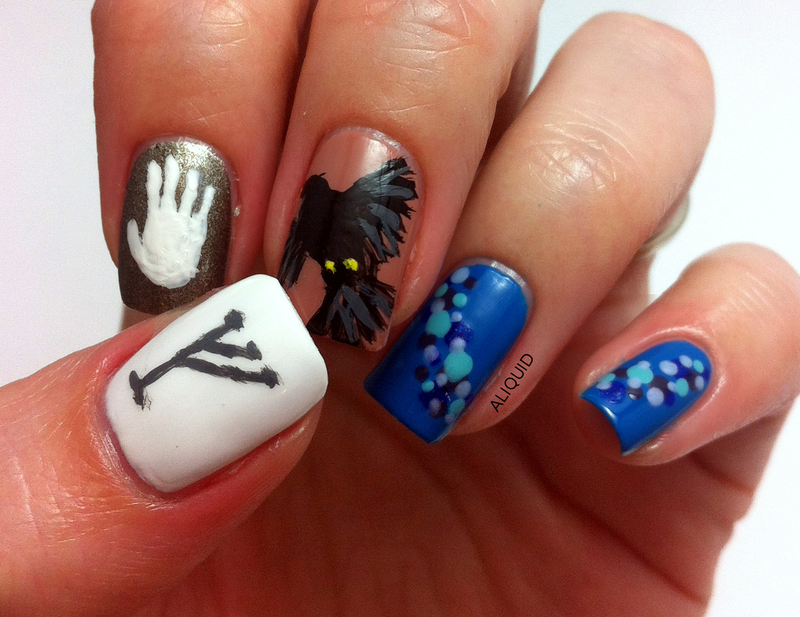 On my middle finger is Radagast the Brown. He's mentioned a few times in Lord of the Rings. He was the one who sent the Eagle to rescue Gandalf from the top of Orthanc (no magic moths in the book!). He was mostly interested in animals and plants, and didn't do much to help fight Sauron. Radagast's real name is Aiwendil, 'bird-friend', so I gave him a blackbird. 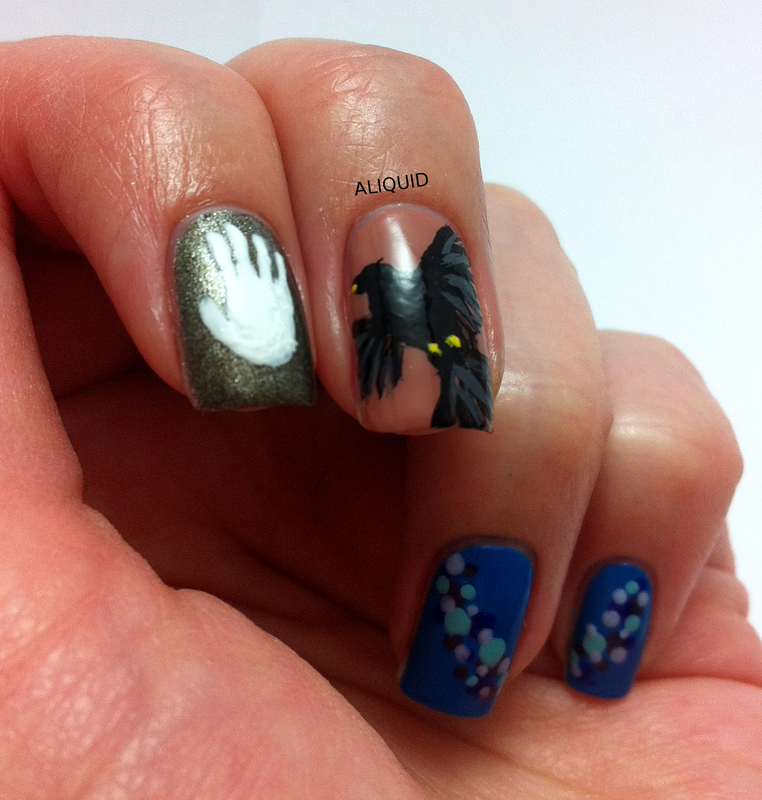 The base color is Sephora by OPI Leotard Optional, and the bird is done in acrylic (I think it turned out really well!). Finally, we don't know much about the last two wizards, except that they were friends and wore blue. They traveled far to the east, off the known maps of Middle-Earth, to fight Sauron's influence there, and were never heard from again. 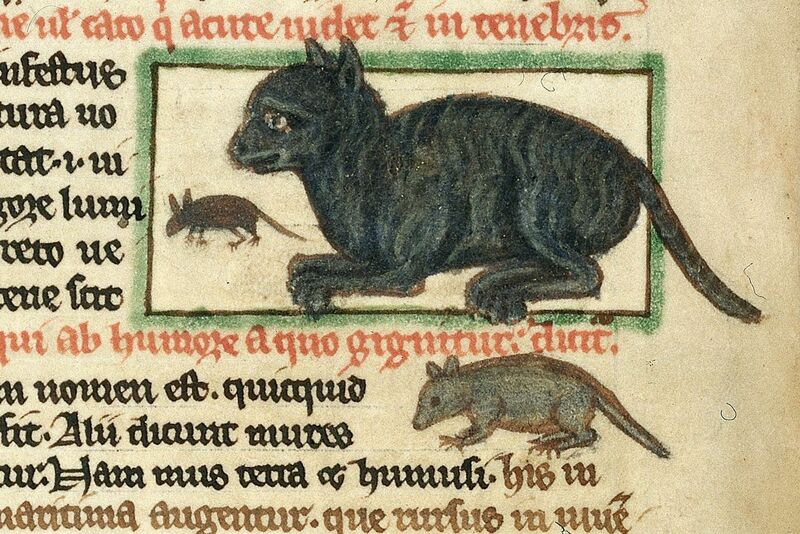 Their names were Alatar and Pallando, or Morinehtar and Romestamo ('darkness-slayer' and 'East-helper'). Since we don't really know about their personalities, I chose to give them a kind of wizardly-looking sweep of dots. :-D The base color is China Glaze Hanging in the Balance, and the dots are Julep Millie, Orly Royal Navy, Wet 'n' Wild I Need a Refresh-Mint, and Wet 'n' Wild Shameless. 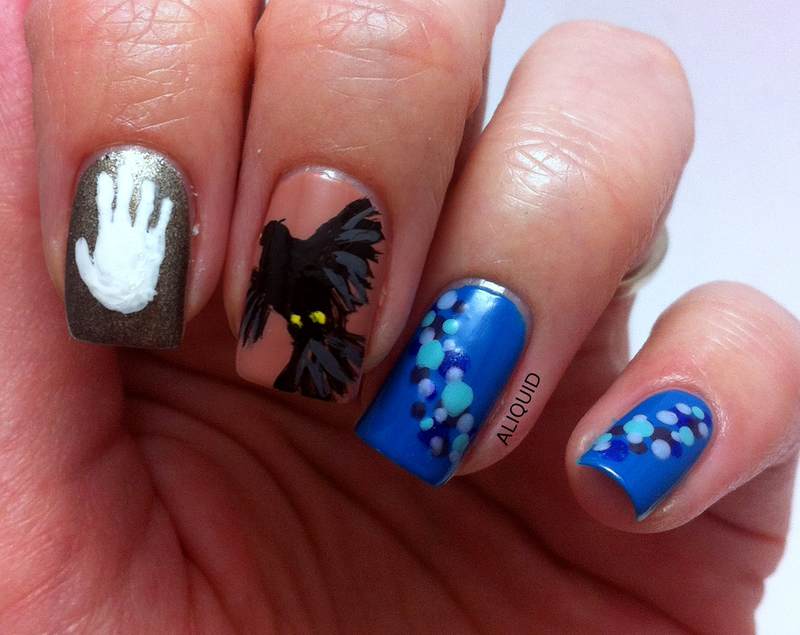 I'm a little mad that I blurred the dots on my ring finger, even though I waited an hour before putting on topcoat! Well, am I a geek or what? How did I do? I had fun doing this mani, and I'm hoping to participate in future Polish Days! This is the usual tape mani. I started yesterday by painting my nails in Maybelline Porcelain Party (the white) and letting it dry overnight. Today I stuck on pieces of tape to get the outline of the chevrons and painted my tips (Sephora by OPI Thyme for a Mani and Zoya Ziv). Then the black stripes...I originally intended to use a Sally Hansen nail art pen to do the stripes, but it ended up bleeding a lot and making blotches everywhere. :-/ Kinda disappointed about that purchase. So I resorted to using acrylic paint and a striper brush. The lines came out a little wiggly but they look good from a distance anyway! I also painted my toes to match the dress, using L'Oreal Orange You Jealous? Now I'm all set for the weekend! What's your weekend mani going to be ?